Pursuant to Articles 2 and 4 of Council Regulation (EC) No 2371/2002 of 20 December 2002 on the conservation and sustainable exploitation of fisheries resources under the Common Fisheries Policy (3), the Council is to establish, taking into account available scientific, technical and economic advice, Community measures necessary to ensure exploitation of living aquatic resources that provides sustainable economic, environmental and social conditions. To that end, the Council may adopt technical measures to limit fishing mortality and the environmental impact of fishing activities. The accession of the Community to the Convention on Fishing and Conservation of the Living Resources in the Baltic Sea and the Belts, as amended by the Protocol to the Conference of the representatives of the States Parties to the Convention (hereinafter referred to as the Gdansk Convention) was approved by Decision 83/414/EEC (4). Since it was established by the Gdansk Convention, the International Baltic Sea Fishery Commission (IBSFC) has adopted a body of measures for the conservation and management of fishery resources in the Baltic Sea. It notified the Contracting Parties of certain recommendations to modify those technical measures. It is appropriate for the Community to give effect to such recommendations. However, since the IBSFC may be superseded by bilateral cooperation with the Russian Federation, the Community rules should not follow strictly those recommendations but should rather seek to establish a comprehensive and consistent system of technical measures for Community waters, based on the existing rules. There is scope for simplification in some cases where the existing rules are unnecessarily detailed and/or cannot be justified for the conservation of resources. Regulation (EC) No 88/98 (5) laid down certain technical measures for the conservation of fishery resources in the waters of the Baltic Sea, the Belts and the Sound. The application of Regulation (EC) No 88/98 has brought to light certain deficiencies in that Regulation which have resulted in problems of application and enforcement and which should be rectified, notably by defining target species and required catch percentages applicable for different mesh size ranges and geographical areas when fishing with certain gears. The manner in which the percentages of target species and of other species are to be calculated should be defined. The minimum size of each species should be fixed taking into account the selectivity of the mesh size of the fishing gear which can be used for that species. Scientific information indicates that there are large by-catches of juvenile cod in eel fishery with trawls. The fishing of eel with active gear should therefore be prohibited. The Gulf of Riga is a unique and rather sensitive marine ecosystem which requires special measures to ensure sustainable exploitation of its resources and to minimise the impact of fishing activities. Article 21 of the 2003 Act of Accession, therefore, provides that the Council is to amend Regulation (EC) No 88/98 before the date of accession with a view to adopting the necessary conservation measures in the Gulf of Riga. In order to control fishing activities, access to the Gulf of Riga should be subject to special fishing permits as referred to in Council Regulation (EC) No 1627/94 of 27 June 1994 laying down general provisions concerning special fishing permits (6). Scientific information indicates that, for cod, towed gears without exit window and with normal diamond knotted netting in the codend and the extension piece are less selective than those with the BACOMA type exit window or where the netting in the codend and extension piece is turned 90°. It is therefore appropriate not to allow, within Community waters and for Community vessels, the use of towed gears without the BACOMA type exit window or without the netting in the codend and extension piece being turned 90° when cod is a target species. Regulation (EC) No 1434/98 (7) laid down conditions under which herring may be landed for industrial purposes other than direct human consumption. In order to simplify the complex rules of Regulation (EC) No 1434/98, the provisions of that Regulation that are of relevance for the Baltic Sea should be replaced by general provisions on unsorted landings in this Regulation. Regulation (EC) No 1434/98 should be amended accordingly. Amendments to Annex I and to Appendices 1 and 2 to Annex II to this Regulation should also be adopted in accordance with Decision 1999/468/EC. This Regulation lays down technical conservation measures in relation to the taking and landing of fishery resources in the maritime waters under the sovereignty or jurisdiction of the Member States and situated in the geographical area specified in Annex I. ‘extension piece’ means an untapered section of the trawl having a cylindrical shape, i.e. the same circumference as the codend throughout, attached to or a continuation of the codend. 1. For each of the subdivisions listed in Annex I, the ranges of mesh size admissible for each target species shall be as defined in Annex II when fishing with trawls, Danish seines and similar gears and as defined in Annex III when fishing with gillnets, entangling nets and trammel nets. No part of the gears or nets shall have a mesh size less than the smallest mesh size within each mesh size range. 2. The minimum percentage of the target species among the living aquatic resources retained on board for each geographic subdivision and each range of mesh size is set out in Annex II and Annex III. 3. During any fishing voyage when dredges are carried on board, the retention on board and the landing of any quantity of living aquatic resources shall be prohibited unless at least 85 % of the live weight thereof consists of molluscs and/or Furcellaria lumbricalis. 4. The use, within a subdivision, of gillnets or entangling nets having mesh sizes smaller than those referred to in Annex III shall be prohibited. 5. 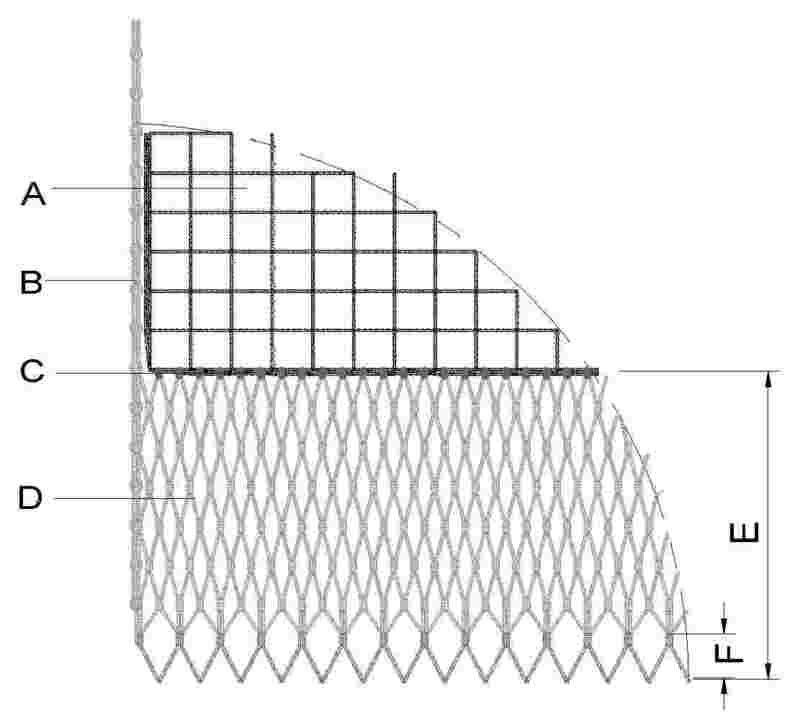 The use, within a subdivision, of trammel nets with mesh size in that part of the net having the largest meshes that does not correspond to one of the categories set out in Annex III unless the mesh size in the part of the net having the smallest meshes is smaller than 16 mm shall be prohibited. 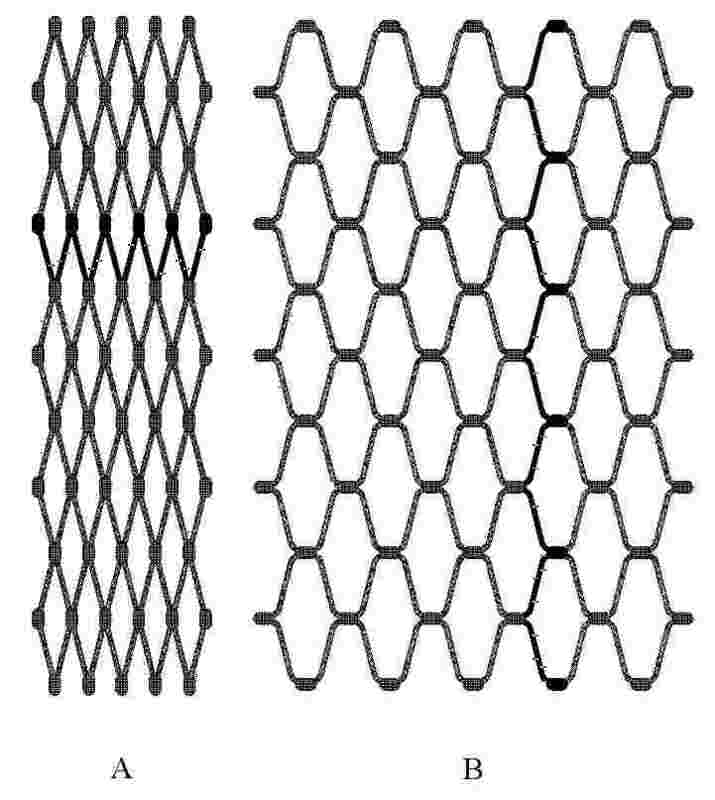 If the mesh size in the smallest meshes is less than 16 mm, all meshes with a mesh size above 16 mm shall correspond to the categories set out in Annex III. 6. For each fishing voyage, landings shall be prohibited whenever the catch taken in the subdivisions listed in Annex I, and retained on board, does not comply with the corresponding conditions laid down in Annex II or Annex III. 1. The percentages of target species referred to in Annexes II and III shall be calculated as the proportion by live weight of all species listed in Annexes II and III which are either retained on board after sorting or landed. 2. The percentage of target species and of other species shall be obtained by aggregating all quantities of target species and of other species listed in Annexes II and III retained on board. 3. The quantities of species listed in Annexes II and III that have been transhipped from a fishing vessel shall be taken into account when calculating the percentages of target species for that vessel. 4. The percentages of target species may be calculated on the basis of one or more representative samples. 1. No device shall be used which obstructs or otherwise diminishes the mesh in the codend. 2. By way of derogation from paragraph 1, it shall be permitted to attach to the outside of the lower half of the codend of any active gear, any canvas, netting or other material which has the purpose of preventing or reducing wear. Such material shall be attached along the forward and lateral edges of the codend only. 3. By way of derogation from paragraph 1, when fishing with trawls, Danish seines or similar gears with a mesh size less than 90 mm, it shall be permitted to attach to the outside of the codend a strengthening bag. The mesh size of the strengthening bag shall be at least twice as large as that of the codend and in no case less than 80 mm. circumferentially between the rear and front part. longitudinally along a single row of meshes. use a back strap attached to the outside of the codend. The distance between the back strap and the codline shall be equal to or smaller than 50 cm. any codend where the stretched length of the top half is not approximately equal to the stretched length of the bottom half. The Commission shall, on the basis of advice from the Scientific, Technical and Economic Committee for Fisheries, present to the Council not later than September 2007 an assessment of the selectivity on cod of active gears for which cod is recognised as target species. 1. Where fishing is conducted using gillnets, entangling nets or trammel nets, the use of more than 9 km of nets for vessels with an overall length of up to and including 12 m and 21 km of nets for vessels with an overall length of more than 12 m shall be prohibited. 2. The immersion time of the nets referred to in paragraph 1 shall not exceed 48 hours. 3. By way of derogation from paragraph 2, the immersion time of nets referred to in paragraph 1 when fishing under the ice cover shall not be limited. 1. From 1 January 2008 it shall be prohibited to keep on board, or use for fishing, driftnets. 2. In 2006 and 2007, a vessel may keep on board, or use for fishing, driftnets if authorised to do so by the competent authorities of the flag Member State. 3. In 2006 and 2007, the maximum number of vessels which may be authorised by a Member State to keep on board, or use for fishing, driftnets shall not exceed 40 % and 20 % respectively of the fishing vessels which used driftnets during the period 2001 to 2003. 4. By way of derogation from paragraph 3, in subdivisions 25 to 32 the maximum number of vessels which may be authorised by a Member State to keep driftnets on board or use them for fishing shall not exceed 40 % of the fishing vessels which used driftnets during the period 2001 to 2003. 5. Member States shall communicate to the Commission by 30 April each year the list of vessels authorised to carry out fishing activities using driftnets. the quantity, date and position of by-catches of cetaceans. 2. All fishing vessels using driftnets shall keep on board the authorisation referred to in Article 9(2). Commission Regulation (EC) No 129/2003 of 24 January 2003 laying down detailed rules for determining the mesh size and thickness of twine of fishing nets (9) shall apply. 1. Quantities of living aquatic resources caught in excess of permitted percentages specified in Annexes II and III may not be landed but shall be returned to the sea before each landing. 2. Notwithstanding paragraph 1, whenever during a fishing voyage a vessel leaves any of the groups of subdivisions listed in Annexes II and III, the minimum percentage of target species as set out in Annexes II and III caught and retained on board from that geographical area shall be met within two hours. 1. Gear that may not be used within a certain geographical area or during a certain period shall be stowed away in such a manner that it is not ready for use in the prohibited area or during the prohibited period. Reserve gear shall be stowed away separately and in such a manner that it is not ready for use. in the case of purse seines, the main or bottom wire is unshackled from the seine. 3. By way of derogation from paragraph 1, where any gear is used for which cod (Gadus morhua) is defined as a target species in accordance with Annexes II or III, no other type of gear shall be kept on board. 1. A fish shall be regarded as undersized if it is smaller than the minimum size specified in Annex IV for the relevant species and the relevant geographical area. 2. The size of a fish shall be measured from the tip of the snout, with mouth closed, to the extreme end of the tail fin. 1. Undersized fish shall not be retained on board or be transhipped, landed, transported, stored, sold, displayed or offered for sale, but shall be returned immediately to the sea. 2. For fish other than those defined in Annex II as target species for the mesh size categories ‘smaller than 16 mm’ or ‘16 to 31 mm’ caught with trawls, Danish seines or similar gears of a mesh size less than 32 mm, or with purse seines, paragraph 1 shall not apply, provided that those fish are not sorted and not sold, displayed or offered for sale for human consumption. from 15 June to 30 September in waters of subdivision 32. 2. The area of prohibition during the closed season shall be beyond four nautical miles measured from the baselines. 3. By way of derogation from paragraph 1, the retention on board of salmon (Salmo salar) or sea trout (Salmo trutta) caught with trap-nets shall be permitted. The retention on board of eel caught with any active gear shall be prohibited throughout the year. 1. Unsorted catches shall be landed only at ports and landings sites where a sampling programme referred to in paragraph 2 is in operation. 2. Member States shall ensure that an adequate sampling programme allowing effective monitoring of unsorted landings by species is in place. 1. In order to fish in subdivision 28-1, vessels shall hold a special fishing permit issued in accordance with Article 7 of Regulation (EC) No 1627/94. 2. Member States shall ensure that vessels, to which the special fishing permit referred to in paragraph 1 has been issued, are included in a list, containing their name and internal registration number, made publicly available via an Internet website, the address of which shall be provided to the Commission and Member States by each Member State. the engine power of a vessel must not exceed 221 kilowatts (kW) at any time. the engine power of any replacement vessel does not exceed 221 kW at any time. the power of the replacement engine is not such that replacement leads to an increase in the total engine power as indicated in Article 20(3)(a) for the Member State concerned. In subdivision 28-1, fishing with trawl shall be prohibited in waters of less than 20 m in depth. 1. The catching of living aquatic resources using methods incorporating the use of explosives, poisonous or stupefying substances, electric current or any kind of projectile shall be prohibited. 2. The sale, display or offer for sale of living aquatic resources caught using methods referred to in paragraph 1 shall be prohibited. the vessel conducting the fishing operations must carry on board an authorisation issued by the Member State whose flag the vessel is flying. they are sold directly for purposes other than human consumption. This Regulation shall not apply to fishing operations conducted solely for the purpose of artificial restocking or transplantation of living aquatic resources which are carried out with the permission and under the authority of the Member State or Member States concerned. Where the artificial restocking or transplantation is carried out in the waters of another Member State or Member States, all the Member States concerned shall be informed in advance. go beyond minimum requirements set out in Community fisheries Regulations. 2. Measures referred to in paragraph 1 shall apply solely to the fishermen of the Member State concerned and shall be compatible with Community law. 3. The Member State concerned shall communicate such measures without delay to the other Member States and the Commission. 4. Member States shall supply the Commission, on its request, with all information needed for the assessment of whether the measures comply with the conditions laid down in paragraph 1. 5. If the Commission concludes that the measures do not comply with the conditions laid down in paragraph 1 it shall adopt a decision requiring the Member State to withdraw or modify the measures. By 1 January 2008, the Commission shall ensure that a scientific assessment of the effects of using in particular gillnets, trammel nets and entangling nets on cetaceans is conducted and its findings presented to the European Parliament and Council. Detailed rules for the implementation of this Regulation shall be adopted in accordance with the procedure referred to in Article 30(2) of Regulation (EC) No 2371/2002. Amendments to Annex I and to Appendices 1 and 2 to Annex II shall be adopted in accordance with the procedure referred to in Article 30(3) of Regulation (EC) No 2371/2002. Regulation (EC) No 88/98 shall be repealed. Done at Brussels, 21 December 2005. (1) OJ C 125, 24.5.2005, p. 12. (2) Opinion delivered on 13 October 2005 (not yet published in the Official Journal). (4) OJ L 237, 26.8.1983, p. 4. (5) OJ L 9, 15.1.1998, p. 1. Regulation as last amended by Regulation (EC) No 289/2005 (OJ L 49, 22.2.2005, p. 1). (7) OJ L 191, 7.7.1998, p. 10. (9) OJ L 22, 25.1.2003, p. 5. The waters bounded by a line drawn from Hasenøre Head (56° 09′ N, 10° 44′ E) on the east coast of Jutland to Gniben Point (56° 01′ N, 11° 18′ E) on the west coast of Zealand; then along the west coast and south coast of Zealand to a point situated at longitude 12° 00′ E; from there, due south to the island of Falster; then along the east coast of the island of Falster to Gedser Odde (54° 34′ N, 11° 58′ E); then due east to longitude 12° 00′ E; then due south to the coast of Germany; then in a south-westerly direction along the coast of Germany and the east coast of Jutland as far as the point of departure. The waters bounded by a line drawn from Gilbjerg Head (56° 08′ N, 12° 18′ E) on the north coast of Zealand to Kullen (56° 18′ N, 12° 28′ E) on the coast of Sweden; then in a southerly direction along the coast of Sweden to the Falsterbo lighthouse (55° 23′ N, 12° 50′ E); then through the southern entrance to the Sound to the Stevns lighthouse (55° 19′ N, 12° 28′ E) on the coast of Zealand; then in a northerly direction along the east coast of Zealand as far as the point of departure. The waters bounded by a line drawn from the Stevns lighthouse (55° 19′ N, 12° 28′ E) on the east coast of Zealand through the southern entrance to the Sound to the Falsterbo lighthouse (55° 23′ N, 12° 50′ E) on the coast of Sweden; then along the south coast of Sweden to the Sandhammaren lighthouse (55° 24′ N, 14° 12′ E); from there to the Hammerodde lighthouse (55° 18′ N, 14° 47′ E) on the north coast of Bornholm; then along the west and south coasts of Bornholm to a point situated at longitude 15° 00′ E; from there due south to the coast of Poland; then in a westerly direction along the coasts of Poland and Germany to a point situated at longitude 12° 00′ E; then due north to a point situated at latitude 54° 34′ N and longitude 12° 00′ E; then due west to Gedser Odde (54° 34′ N, 11° 58′ E); from there, along the east and north coast of the island of Falster to a point situated at longitude 12° 00′ E; from there, due north to the south coast of Zealand; then in a westerly and northerly direction along the west coast of Zealand as far as the point of departure. The waters bounded by a line drawn from a point on the east coast of Sweden at latitude 56° 30′ N and proceeding due east to the west coast of the island of Öland; then, after passing south of the island of Öland to a point on the east coast situated at latitude 56° 30′ N, due east to longitude 18° 00′ E; then due south to the coast of Poland; then in a westerly direction along the coast of Poland to a point situated at longitude 15° 00′ E; then due north to the island of Bornholm; then along the south and west coasts of Bornholm to the Hammerodde lighthouse (55° 18′ N, 14° 47′ E); then to the Sandhammaren lighthouse (55° 24′ N, 14° 12′ E) on the south coast of Sweden; then in a northerly direction along the east coast of Sweden as far as the point of departure. The waters bounded by a line drawn from a point situated at latitude 56° 30′ N and longitude 18° 00′ E and proceeding due east to the west coast of Latvia; then in a southerly direction along the coasts of Latvia, Lithuania, Russia and Poland to a point on the Polish coast situated at longitude 18° 00′ E; then due north as far as the point of departure. The waters bounded by a line drawn from a point on the east mainland coast of Sweden situated at latitude 59° 41′ N and longitude 19° 00′ E and proceeding due south to the north coast of the island of Gotland; then in a southerly direction along the west coast of Gotland to a point situated at latitude 57° 00′ N; then due west to longitude 18° 00′ E; then due south to latitude 56° 30′ N; then due west to the east coast of the island of Öland; then, after passing south of the island of Öland, to a point on its west coast situated at latitude 56° 30′ N; then due west to the coast of Sweden; then in a northerly direction along the east coast of Sweden as far as the point of departure. The waters bounded in the west by a line drawn from 57° 34,1234′ N, 21° 42,9574′ E to 57° 57,4760′ N, 21° 58,2789′ E, then southwards to the southernmost point of the peninsula of Sõrve and then in a north-eastern direction along the east coast of the island of Saaremaa; and in the north by a line drawn from 58° 30,0′ N, 23°13,2′ E to 58° 30,0′ N, 23°41,1′ E.
The waters bounded by a line drawn from a point situated at latitude 58° 30′ N and longitude 19° 00′ E and proceeding due east to the west coast of the island of Saaremaa; then, southwards along the west coast of Saaremaa to latitude 57° 57,4760′ N and longitude 21° 58,2789′ E; then south to a point situated at latitude 57° 34,1234′ N and longitude 21° 42,9574′ E; then following the Latvian coast southwards to a point situated at latitude 56° 30′ N; then due west to longitude 18° 00′ E; then due north to latitude 57° 00′ N; then due east to the west coast of the island of Gotland; then in a northerly direction to a point on the north coast of Gotland situated at longitude 19° 00′ E; then due north as far as the point of departure. The waters bounded by a line drawn from a point on the east mainland coast of Sweden situated at latitude 60° 30′ N and proceeding due east to the mainland coast of Finland; then in a southerly direction along the west and south coasts of Finland to a point on the south mainland coast situated at longitude 23° 00′ E; then due south to latitude 59° 00′ N; then due east to the mainland coast of Estonia; then in a southerly direction along the west coast of Estonia to a point situated at latitude 58° 30′ N; then due west to the east coast of the island of Saaremaa; then, after passing north of the island of Saaremaa, to a point on its west coast situated at latitude 58° 30′ N; then due west to longitude 19° 00′ E; then due north to a point on the east mainland coast of Sweden situated at latitude 59° 41′ N; then in a northerly direction along the east coast of Sweden as far as the point of departure. The waters bounded by a line drawn from a point on the east coast of Sweden situated at latitude 63° 30′ N and proceeding due east to the mainland coast of Finland; then in a southerly direction along the coast of Finland to a point situated at latitude 60° 30′ N; then due west to the mainland coast of Sweden; then in a northerly direction along the east coast of Sweden as far as the point of departure. The waters bounded by a line drawn from a point on the east coast of Sweden situated at latitude 63° 30′ N and proceeding, after passing north of the Gulf of Bothnia, to a point on the west mainland coast of Finland situated at latitude 63° 30′ N; then due west as far as the point of departure. The waters bounded by a line drawn from a point on the south coast of Finland situated at longitude 23° 00′ E and proceeding, after passing east of the Gulf of Finland, to a point on the west coast of Estonia situated at latitude 59° 00′ N; then due west to longitude 23° 00′ E; then due north as far as the point of departure. (1) The catch retained on board shall consist of no more than 3 % of cod by live weight. (2) Only trawls, Danish seines and similar gears with Bacoma exit window or with T90 codend and extension piece with mesh size and specifications as laid down in Appendices I and II shall be authorised. (3) The use of beam trawl shall not be authorised. (4) The catch retained on board may consist of up to 40 % of whiting by live weight. (5) The catch retained on board may consist of up to 45 % of herring by live weight. The window shall be a rectangular section of netting in the codend. There shall be only one window. The codend shall be constructed of two panels, joined together by selvedges one on each side of equal length. The minimum mesh size of the diamond meshes shall be 105 mm. The material of the yarn shall be of polyethylene threads with a single twine thickness of no more than 6 mm or with double twine thickness of no more than 4 mm respectively. The use of codends and extension pieces which are made of only one piece of net material and have only one selvedge shall be prohibited. The number of open diamond meshes, excluding those in the selvedges, at any point on any circumference of any extension piece shall not be less or more than the maximum number of meshes on the circumference of the front end of the codend (Figure 1). The window shall be inserted into the top panel of the codend (Figure 2). The window shall terminate not more than four meshes from the codline, inclusive of the hand-braided row of meshes through which the codline is passed (Figure 3 or 4). The width of the window, expressed in number of mesh bars, shall be equal to the number of open diamond meshes in the top panel divided by two. If necessary, it will be allowed to maintain at the most 20 % of the number of open diamond meshes in the top panel divided evenly on the both sides of the window panel (Figure 4). The length of the window shall be at least 3,5 m.
By way of derogation from point ii the length of the window shall be at least 4 m if a sensor dedicated to the measurement of the volume of the catches is attached to the window. The meshes shall have a minimum mesh opening of 110 mm. The meshes shall be square meshes i.e. all four sides of the window netting will be cut all bars. The netting shall be mounted such that the bars run parallel and perpendicular to the length of the codend. The netting shall be knotless braided single twine or netting with similar proven selective properties. Knotless netting means netting which is composed of meshes of four sides in which the corners of the meshes are formed by the interweaving of the twines of two adjacent sides of the mesh. The diameter of the single yarn shall be at least 5 mm. The mounting specifications are defined in Figures 3 and 4. 3 m for a codend of circumference of less than 75 diamond meshes measured in front of the window. A back strap shall not encircle the BACOMA exit window. It shall be made of rope not more than 20 mm in diameter and be at least 2 m long. A codend buoy shall be spherical in shape and have a maximum diameter of 40 cm. It shall be fastened through the buoy rope to the cod line. A flapper shall not overlap the BACOMA exit window. The use of a square mesh BACOMA exit window which has 10 % or more meshes repaired shall be prohibited. Square meshes which have been damaged shall be repaired according to the prescribed method. 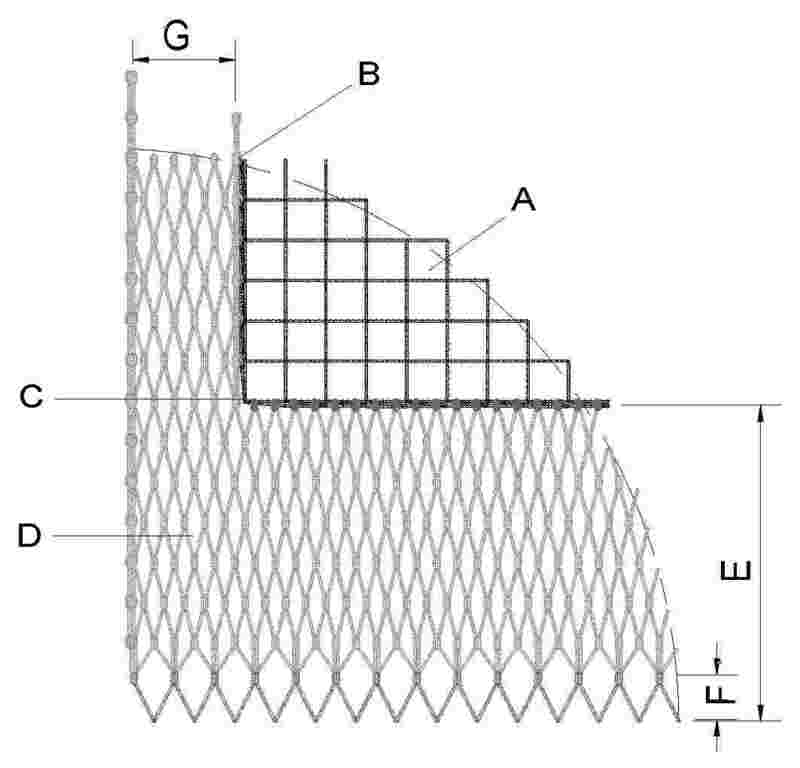 A repaired mesh is any mesh where the mesh opening is reduced by a repair of damaged meshes or by the joining of two pieces of knotless square mesh netting. Count the meshes to be replaced. Prepare a patch using knotless braided single twine that is the same material, diameter and strength of the net needing to be patched. The patch should be no more than two meshes larger in each direction than the cleaned-up hole to provide sufficient netting to overlap the edges of the hole. Lay the patch over the hole and lace it to the existing netting using braided twine, as shown in the illustration. Make sure to lace the crosses of the netting together. Continue lacing around the hole so that you have at least two rows of lacing around the patch. 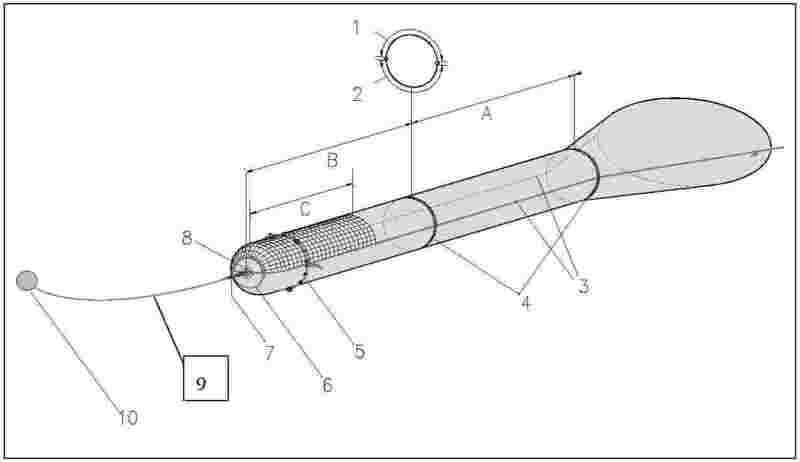 The patched hole will resemble the above illustration when finished. Trawl gear can be divided into three different sections according to shape and function. The trawl body is always a tapered section. The extension piece is an untapered section normally manufactured of either one or two pieces of nets. The codend is also an untapered section often made of double twine in order to have a better resistance against heavy wearing. The part below the lifting strap is called lifting bag. 1. T90 trawls are defined as trawls, Danish seines and similar gears having a codend and extension piece produced from diamond knotted netting turned 90° so that the main direction of run of the netting twine is parallel to the towing direction. 2. The direction of run of the netting twine in a standard diamond knotted net (A) and in a net turned 90° (B) is illustrated in Figure 1 below. The mesh size shall be at least 110 mm. By way of derogation from Article 5(1) of Regulation (EC) No 129/2003, the mesh size in the codend and the extension piece shall be measured perpendicular to the longitudinal axis of the fishing gear. The material of the yarn of the codend and the extension piece shall be of polyethylene threads with a single twine thickness of no more than 6 mm or with double twine thickness of no more than 4 mm respectively. This provision shall not apply to the rear most row of meshes in the codend if fitted with a codline. 1. A codend and extension of turned meshes (T90) shall be constructed from two panels of equal dimensions, with the same number of meshes in width and length, and with the mesh orientation described above, joined by two lateral selvedges. Each panel shall be constructed with non-slip knots and in such a way that the meshes remain fully open at all times when in use. 2. The number of open meshes in any circumference must be constant from the front part of the extension to the rear most part of the codend. 3. 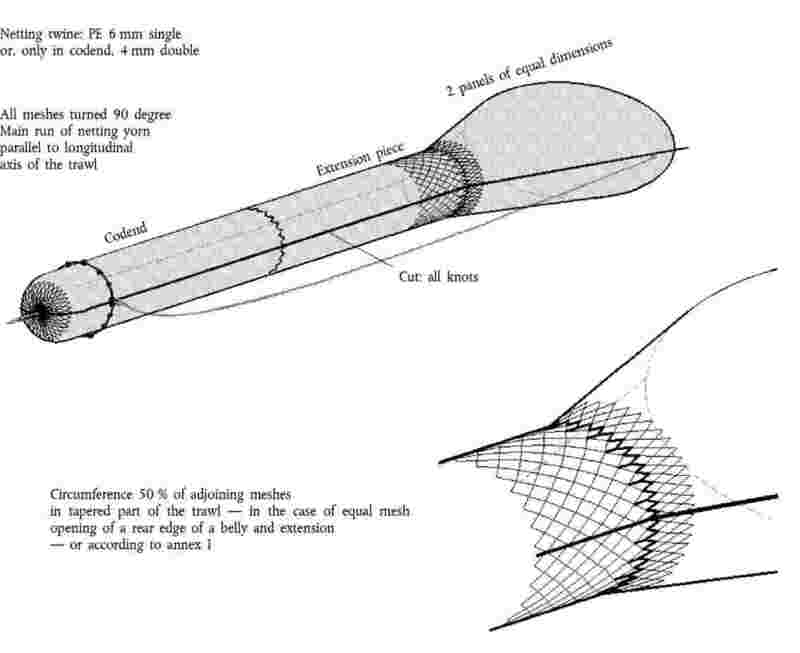 At the point of attachment of the codend or extension piece to the tapered part of the trawl, the number of meshes in circumference of the codend or extension piece must be 50 % of the last row of meshes of the tapered part of the trawl. 4. 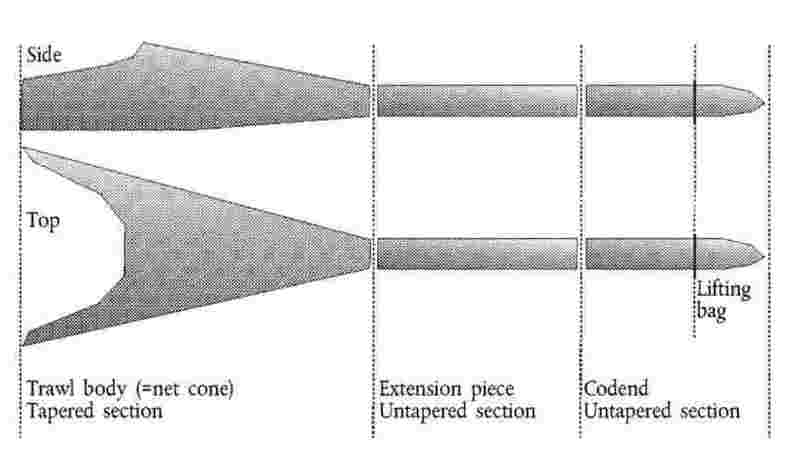 A codend and extension piece is illustrated in Figure 2 below. The number of meshes in any circumference in the codend and the extension piece, excluding joinings and selvedges shall be no more than 50. The forward edge of the panels composing both codend and extension piece shall be fitted out with a braided row of half meshes. The aft edge of codend panel shall be fitted out by a full row of braided meshes able to guide the codline. The length of the lifting strap shall be no less than 3,5 m.
A codend buoy shall be spherical in shape and have a maximum diameter of 40 cm. It shall be fastened through the buoy rope to the codline. (2) Such range of mesh size shall be admissible until 30 June 2006.